Mar. 20 (NBD) -- On the 33rd floor of the IFS building, one of the most expensive office premises in southwest China's Chengdu, is situated the office of electronic music label PILLZ. Wearing a pair of black-framed glasses, Wang Rui, founder of PILLZ, looks like a well-behaved young man and can hardly be associated with avant-garde and crazy electronic music in most people's eyes. "Not every electronic musician is expressive. I seldom go to nightclubs. I don't smoke or drink, but enjoy reading books, watching movies, listening to music and playing football and video games," Wang smiled. Born in 1994, Wang Rui founded PILLZ at the age of 22 when he was pursuing a postgraduate degree in the U.S.
PILLZ, whose Chinese name is "factory of pills", embodies Wang and his label's wish to soothe the young generation with music. "Music in Sichuan dialect has the same pronunciation as pills," Wang explained. Speaking of the electronic music circle worldwide, most record labels in China can only be counted as netlabels, whereas web labels take up a slight proportion in western countries. Since its inception, PILLZ, though a Chinese record label, has been operated and managed in accordance with the standards for a regular U.S. record company. After over two years of development, the electronic music trademark houses 14 groups of artists including two singer-songwriters and 12 producers. Moreover, the label boasts a library of more than 190 songs which were played for over 500 million times in total online. 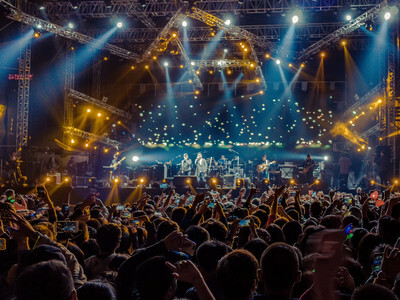 Being a publishing company as well as a concert organizer, PILLZ produces and brings high-quality electronic music to fans at home and abroad, and arranges concerts of international artists in China. In 2018, PIILZ participated in over 110 commercial performances and hosted or planned 8-10. In the list of background music support for popular variety shows such as Running Man, Produce 101, The Coming One, Hot-blood Dance Crew and Street Dance of China, one can always find the name of PILLZ. In early 2018, PILLZ held a rap concert in Los Angeles, inviting China's top rappers on the stage. "80 percent of audiences coming to the concert are Chinese and we also have foreign fans who want to learn about Chinese rap," Wang recalled proudly. Having learned to sing bel canto and play piano and excelled at erhu, Wang used to have a strong interest in classic music. He stepped into the performance industry by chance. "In 2015 when I was a junior student, I invited a professor of Vocal Music from the U.S. to give a lecture and to hold a classic concert in Chengdu." This was the first time that Wang organized a performance. The show went well and the tickets were sold out. "At that moment, I made up my mind to present performances to people. The sense of achievement a successful show gives me is beyond anything that money can buy," said Wang, who later found an opportunity to bring electronic music festival to Chengdu. "The U.S. market is mature where artist resources have been grasped by well-developed companies and those artists are not allowed to perform without permission of their companies," Wang explained. And even if they can perform, they need to be paid double the normal price or three times, Wang added. More importantly, a Chengdu native, Wang deemed the music environment in the city very sound. People there are fond of entertainment and they have certain gift in this industry, which lured Wang to engage in electronic music in the provincial city. In the next move, Wang's record label plans to make Chinese-style electronic music, in cooperation with international producers and domestic leading singers. "We are producing a series named 'Yuefu Songs of the Han Dynasty', inviting Chinese-style singers, professors of Central Conservatory of Music as well as pop singers to present the folk-ballad tradition in the form of electronic music," Wang elaborated.